The best way to multitask your Google Mobile Apps! G-Whizz! Pro version 1.2 has been released! 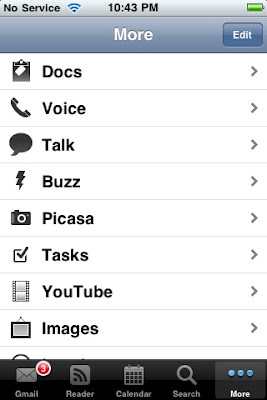 ✔ Full support for multitasking in iOS 4! ✔ Full Retina Display compatibility for iPhone 4! ✔ Facebook and Twitter mobile apps now included! ✔ Read it Later and Tweet This browser actions! ✔ Application badge (see number of unread events from the home screen)! ✔ Now loads all tabs on startup for quicker browsing (with option to disable this if your internet connection can't handle it)! Also, please note that we've become aware of a bug in this version that causes the ratings prompt to appear every time at startup. This is more noticeable on iPad then iPhone (because of the iPhone's multitasking). We've already submitted a fix for this and hope that it will be approved soon. Please don't take this out on us in the ratings! :) Thanks for your continued feedback! We've just created a Google Group for fans of G-Whizz! Please leave us your comments/feedback/suggestions at the link above (not in the comments below, please!) and we'll answer as soon as humanly possible! Thanks for your continued support and fantastic feedback! I've been getting a few complaints/request to be able to rearrange tabs or to place certain tabs on the front page. I'd like to clarify that it is possible to rearrange tab order in G-Whizz! This capability has been present since version 1.0 of the app. Rearranging tab order is actually a standard convention in all iPhone OS TabBar applications (like G-Whizz!) that contain more tabs than can fit on the front screen. Simply click on the "More" tab on the right, then click on the "Edit" button in the upper-right-hand corner of the "More" screen. This will then bring up another screen that displays all available icons on top, and on bottom displays the icons that will be present on the main screen. Simply drag any of the icons from this top group to the position on the bottom row where you would like it to reside. You can also drag icons on the bottom to different positions. When you are done, simply click the "Done" button and your order will be saved. That's all there is to it! See screenshot below for an example of the "Edit" screen. Unread badges now available for Reader! Added option to automatically reload Gmail or Reader tabs if you move to that tab and there are new items since last visit. Added option to use desktop versions of Gmail, Calendar or Reader as default (please note that only Basic HTML is currently available for Gmail and that for Calendar the user is alerted that not all features may work in Mobile Safari). Enabled Tasks for iPad (not all features may work due to limitations in Google's implementation on iPad) . Minor tweaks to link detectors (now detects attachments in Gmail properly). The application no longer checks for updates while device is asleep (if app is open). It will automatically check when device leaves sleep. This is to preserve battery life. Updated documentation (explanation of settings). I've been getting many questions about this so I thought I'd share some info. Currently Google Docs can be browsed on the iPad and iPhone, but only Spreadsheets can be edited. I've clarified the G-Whizz! app description to make this clear. I'm sure Google has plans to make these editable at some point, and of course G-Whizz! will be ready for that when the time comes. Thanks for your understanding! Are you tired of having to switch between browser windows just to access your favorite Google websites? 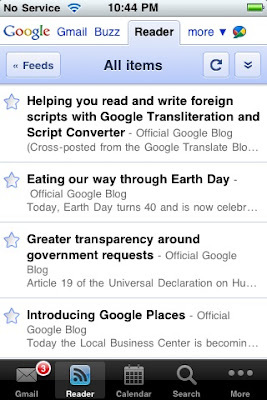 Are you yearning for the ability to multitask your Google services on iPhone or iPad? If so, G-Whizz! is the app for you (App Store link)! G-Whizz! brings all of your favorite Google mobile websites to one convenient app. After the initial load of each site, you can effortlessly switch between tabs to quickly check your Gmail, read some stories in Reader, or edit your documents in Docs. Support for iPhone AND iPad! 18 of your favorite Google mobile sites (see below)! 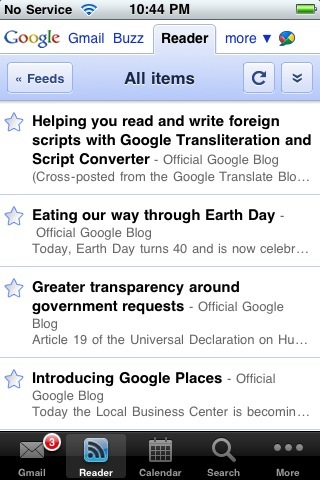 For Gmail, a convenient unread badge keeps you informed if you mail arrives while you're browsing another site. For Reader, stories load in a pop-up window. After you finish, simply dismiss the window and you're back to your reading list! For Reader external links, content can be displayed in a mobile-friendly format or optionally with original formatting. Email links are detected from within the app and a pop-up window (with appropriate fields filled-out) allows you to send your message without leaving the app! Tapping links to other Google services will be detected and automatically take you to the appropriate tab! Ability to use your Google Apps account! Just enable this option and enter your email address in Settings to use Gmail, Calendar and Docs for your domain. 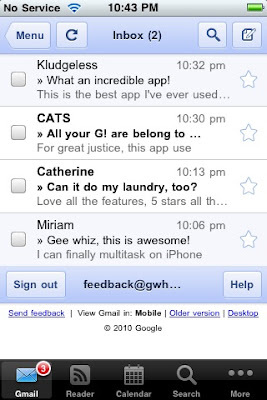 For the other Google apps, log in with your favorite gmail.com address and use them simultaneously Google Apps account! This application was created to fill a personal need. There just wasn't anything available that allowed me to use my favorite sites as easily as I wanted. I hope you find this app as useful as I have! This application is not affiliated with or endorsed by Google, but of course it wouldn't have been possible without their tremendous work building such awesome sites! Thanks, Google!